Making cat and dog friends so that they can live peacefully may not be possible if there is no human assistance. Nevertheless, with the right strategies, it is possible to make these two animals the best of friends. This sensitive procedure should be done using delicate and calculated moves. It is all about making the dog generally friendly to the cat and reducing the fear that the cat has towards the dog. Introduction is one of the fundamental stages of making these two animals get accustomed to each other. The introduction should be done according to the set up of the home. For instance, the new pet that has been brought home should be confined to one room at a distance from the resident pet. The cat and the dog should then be allowed to discover the presence of each other gradually. This is possible through sound and scents. Rewarding the pets is one of the most effective and easy ways of making dogs get used to cats. One does not have to purchase cat friendly dogs in order to see this dream come true. If the dog or the cat reacts with neutral behavior towards the other, a reward could make the pet to maintain same behavior. This can be very easy especially if it involves puppies and kittens. A reward for a positive behavior towards this mission guarantees you that the pet will be able to tolerate the presence of the other one without being inimical. If the dog shows friendly feelings towards the cat, praise him and he will eventually begin to associate with the cats. The cat can only be allowed to see the dog after they are both used to each other’s scents and sounds. However, this is a sensitive stage that needs human supervision and both pets should be placed at a small distance. The cat should be allowed to discover the presence of the dog from a distance and in a calm manner. In case the pets react aggressively during the encounter, distract their attention from the situation by using a toy. This exercise is supposed to be repeated severally in a day. You can only move to the second stage after you are completely sure that both the cat and the dog are now friendly. Veterinary experts have also proved that this familiarization exercise can be easy if it involves a kitten or a puppy as opposed to older ones. This is considered as one of the final stages in making the cat and the dog to be buddies. The cat and the dog are placed in the same room but under supervision. This puts the cat at a higher risk of being injured. This session should be repeated with numerous sessions where the cat and the dog are in the same room. The frequency of these sessions should then be repeated and this time the pets should be closer. However, the pets need to be separated when there is no supervision. It is equally easy to make your cat and dog friends by holding joint training sessions. After they have started being used to each other, exercises can help to cement the new pals and make them companions forever. As they exercise under your supervision, they will eventually learn to tolerate each other and accept each other’s presence. The frequency of the exercise should be done according to the breed and age of the pets. If the right strategies are involved, it will take a short time before your dog starts to tolerate the cat. They can become friends depending on your efforts. However, always remember that the cat and the dog should not be left alone if they are not completely accustomed to each other. 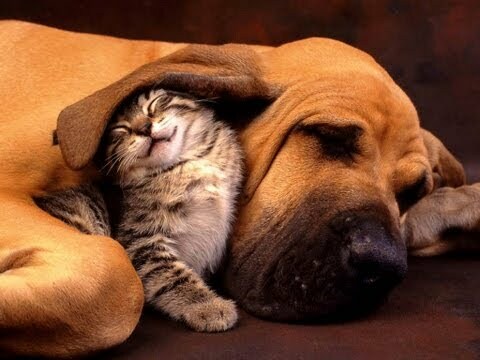 A cat dog friends situation can be successful with proper home set up to create a good environment. The dog should have adequate physical and mental stimulation before the process. Even though there are cat friendly dog breeds it is also easy to make your own dog friendly to the cat by practicing these strategies. Tagged cat dog friends, cat dog friendship images, Dog 101, Dog Emotion, pawsome friends. Bookmark the permalink.